The “4.20” Lushan earthquake in Sichuan province, China has induced a large amount of geological hazards and produced abundant loose materials which are prone to post-earthquake rainfall-triggered landslides. A detailed landslide inventory was acquired through post-earthquake emergent field investigation and high resolution remote sensing interpretation. The rainfall analysis was conducted using historical rainfall records during the period from 1951 to 2010. Results indicate that the average annual rainfall distribution is heterogeneous and the largest average annual rainfall occurs in Yucheng district. The Stability Index MAPping (SINMAP) model was adopted to assess and analyze the post-earthquake slope stability under different rainfall scenarios (light rainfall, moderate rainfall, heavy rainfall, and rainstorm). The model parameters were calibrated to reflect the significant influence of strong earthquakes on geological settings. The slope stability maps triggered by different rainfall scenarios were produced at a regional scale. The effect of different rainfall conditions on the slope stability is discussed. The expanding trend of the unstable area was quantitatively assessed with the different critical rainfall intensity. They provide a new insight into the spatial distribution and characteristics of post-earthquake rainfall-triggered landslides in the Lushan seismic area. An increase of rainfall intensity results in a significant increase of unstable area. The heterogeneous distribution of slope instability is strongly correlated with the distribution of earthquake intensity in spite of different rainfall conditions. The results suggest that the both seismic intensity and rainfall are two crucial factors for post-earthquake slope stability. 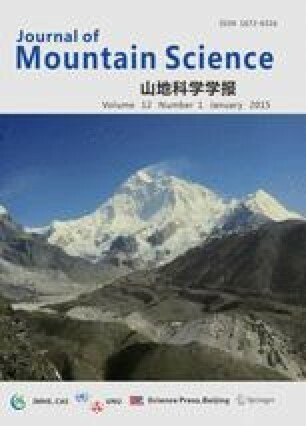 This study provides important references for landslide prevention and mitigation in the Lushan area after earthquake.